Two towering performances compose The Master. That and great cinematography are what the film offers. The plot isn’t much to speak of. It’s just two actors going back and forth at the top of their game and it’s good and gut wrenching. P.T. Anderson’s latest offering is shot in gorgeous 65 mm, the first film to do so from start to finish since 1996’s Hamlet and the colors are beautiful. The 1950s have never looked more alive, in sparkling gold and creeping shadows that draw down on the actors’ faces and turn them into grinning skulls or portraits of self-serving grotesques. Even black and white noir films are hard pressed to use shadows this well. The story follows Freddie Quell (Joaquin Phoenix), a mush-mouthed navy man seriously addicted to alcohol and worse intoxicants. He is broken, violent, brutish. Phoenix plays him as if living in his skin is a daily toil. Thoughts do not come easily to him, working his way down to the very bottom of the post-war American barrel. Suffering from post traumatic stress and the uncontrollable savagery of his own impulsive ignorance, Quell comes into contact with Lancaster Dodd (Phillip Seymour Hoffman), a self-styled physicist and philosopher. Outwardly Dodd is a charming academic on the forefront of a new movement, something called The Cause – a cult to some and salvation to others. Inwardly, he is as twisted as Freddie, possessed of a manic egotism that cannot disguise his own fraud. The two men take to each other immediately and one of The Master’s great achievements is that their fraternity is genuinely, in fact starkly, understandable. I don’t know how many films I’ve seen where the erudite master takes in the wayward rogue or undercover cop with a tip of the hat and a casual “I like your style” and no more is said about it. Freddie and Lancaster fit to each other like hand and glove, the one a beast and the other a monster, painfully bound to themselves and sensing in each other a base kinship that defies The Cause’s genteel persona. Dodd is on a journey through America hoping to win more adherents to The Cause and Freddie joins him as something like a pet project for the noble master. Like any cult worth its salt, The Cause offers Freddie relief from his pain, and though he is handled like a rabid dog by Dodd’s family and friends they sense that Freddie’s rehabilitation is more proof of their master’s magic. Amy Adams delivers a chilling performance as Dodd’s latest wife, with a devotion to The Cause that supersedes its truth. She is his strong right arm, hiding that fact behind a terrible mask of suburban beauty. Her hold on Dodd is tested only by Freddie, who cannot be leashed but can potentially be pacified. Much like Anderson’s previous film, There Will Be Blood, the plot is tamped way down to serve the performances of its stars. Each scene is a stirring moment for either Phoenix or Hoffman to rivet, while The Cause takes off around them. This does not prove an overt distraction until the end, when a decision to leave The Cause by Freddie is not adequately explained. It harms the film, which up until its final 30 minutes has no problem explaining where these characters are coming from and what motivates them onward. Though it does end with a lewd but heartfelt potential for hope. Famously, The Master was a box office flop, making only $25 million back from its $35 million budget. It is said, though not proven, that studios were reluctant to touch it because of Lancaster Dodd’s parallels to L. Ron Hubbard and The Cause’s resemblance to his Dianetics movement. The famously litigious Church of Scientology (and its sway among Hollywood’s prominent) cast an ominous shadow on the production, much like the Hearst empire over Citizen Kane. 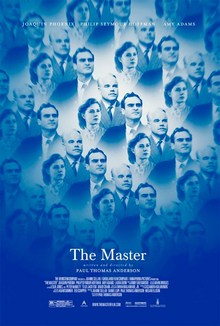 How much does The Master really have to do with Scientology? I can’t tell you that. A cult is a cult, foofaraw is foofaraw, and bunkum is bunkum. I can highly recommend this film for its dueling portraits of hubris and pain. A beautiful composition, The Master does not offer salvation for the ills of the world, it simply knows them when it sees them.